Functional Genomics, the systematic characterisation of the functions of an organism's genes, includes the study of the gene products, the proteins. Such studies require methods to express and purify these proteins in a parallel, time and cost effective manner. We developed a method for parallel expression and purification of recombinant proteins with a hexahistidine tag (His-tag) or glutathione S-transferase (GST)-tag from bacterial expression systems. Proteins are expressed in 96-well microplates and are purified by a fully automated procedure on a pipetting robot. Up to 90 microgram purified protein can be obtained from 1 ml microplate cultures. The procedure is readily reproducible and 96 proteins can be purified in approximately three hours. It avoids clearing of crude cellular lysates and the use of magnetic affinity beads and is therefore less expensive than comparable commercial systems. We have used this method to compare purification of a set of human proteins via His-tag or GST-tag. Proteins were expressed as fusions to an N-terminal tandem His- and GST-tag and were purified by metal chelating or glutathione affinity chromatography. The purity of the obtained protein samples was similar, yet His-tag purification resulted in higher yields for some proteins. A fully automated, robust and cost effective method was developed for the purification of proteins that can be used to quickly characterise expression clones in high throughput and to produce large numbers of proteins for functional studies. His-tag affinity purification was found to be more efficient than purification via GST-tag for some proteins. Functional Genomics, the systematic characterisation of gene function, involves the study of large sets of proteins. It requires methods to express and purify these proteins in a parallel, time and cost effective manner. At the Protein Structure Factory http://www.proteinstrukturfabrik.de, human proteins are expressed in E. coli for structural analysis by crystallisation and NMR . Certainly not all human proteins can be expressed in full length in bacteria in a soluble, folded form. Therefore, large numbers of expression constructs have to be prepared in different vectors and strains, either as full-length proteins or as single domains. The constructs have to be screened for soluble expression and suitable clones are selected for scale up of expression and purification. To facilitate purification the target proteins are fused to affinity tags. The His-tag binds to nickel or cobalt ions that are immobilised on a support . GST-fusion proteins are purified by glutathione affinity chromatography . Those two affinity tags are commonly used for the purification of recombinant proteins. This work compares the purifications of a set of human proteins using either His-tag or GST-tag with respect to purity and yield. We developed a purification procedure that can be performed with non-magnetic affinity resins. This facilitates a straightforward purification scale-up, since the same chromatography material is used for small and large scale protein purification. Our method should be adaptable to other chromatographic media, including other affinity chromatography methods. High-throughput protein expression is routinely performed by structural genomics projects to test expression clones, usually involving small scale cultures in microtiter plates . For initial analysis of protein expression in E. coli, whole and soluble protein extracts are often analysed directly by SDS-PAGE and Coomassie staining, without prior purification of the recombinant expression products [5, 6]. Other groups use commercially available systems for high-throughput protein purification . Commercial high-throughput systems for protein purification, available from Qiagen or Novagen, use magnetic beads or less expensive agarose resins as supports for the respective affinity ligand. Braun et al. manually purified human His-tag, GST-tag and other fusion proteins in 96 well format upon expression in E. coli . They found that GST-fusion proteins have a higher success rate for expression and purification than His-tag proteins under non-denaturing conditions. In this work, we compared the purification via His-tag and GST-tag of proteins carrying both tags. Therefore, our results are independent of the different expression rates of GST-tag versus His-tag fusion proteins. Our method is designed to purify affinity tag fusion proteins upon protein expression in 1 ml cultures in deep-well microplates. Cells are pelleted by centrifugation and all further steps are performed by a robot system. Cells are lysed with lysozyme and then treated with nuclease to degrade DNA, thus decreasing the viscosity of the extract. The crude cell lysates are incubated with affinity agarose beads to bind the recombinantly expressed proteins. In order to separate the beads from the cell extract, the whole samples are transferred into a large pore 96-well filter plate that retains the beads, but not the extract and the cellular debris (Figure 1). The beads are washed and subsequently the target proteins are eluted from the beads in the filter plate. Thereby the clarification of the lysates and the use of expensive magnetic affinity beads is circumvented. By using agarose affinity resins rather than magnetic beads and simple filter plates, the material costs of the procedure are at least five times lower than for alternative commercial systems. Automated purification procedure. Crude lysates containing the target protein bound to affinity beads are transferred into a filter plate. Beads are washed and bound protein is eluted by applying pressure onto the filter plate wells (see methods). We found that the ratio of bead volume to liquid volume during the binding step was critical for the binding efficiency and has to be kept low, e.g. it should not be higher than 1:15, even if the plate is shaken with high speed (1500 rpm). The elution volume was optimised to obtain concentrated protein samples and accomplish complete protein elution. This volume depends on the filter plate. In our protocol 60 μl is used. On the robot system, resin washing and the elution step in the filter plate are performed by applying air pressure onto the wells of the plate (see Figure 1 and methods). This was found to be preferable to applying vacuum to the filter plate which is commonly used for these steps. Vacuum often leads to foaming or incomplete removal of liquid from the filter plate. To demonstrate the reproducibility of the purification procedure, a His-tag fusion of the protein CGI-114 (GenBank accession AAD34109) was purified 48 times in parallel. Protein CGI-114 was expressed in a 100 ml culture. 1 ml aliquots of the culture volume were distributed into 48 wells of a deep well microplate. Cells were pelleted by centrifugation and proteins were automatically purified by the pipetting robot using the affinity chromatography resin Ni-NTA agarose. Protein eluates were analysed by SDS-PAGE (Figure 2) and were quantified by A280 measurement. Protein yield was calculated by multiplying the measured protein concentrations with the elution volume, 60 μl. An elution volume of 60 μl was used for yield calculations – for practical reasons – even though actual eluate recovery ranged from 55 to 70 μl. Meassured yields can be viewed in conc.txt (see additional file 1). 48 purifications of CGI-114-protein. (A) Coomassie stained SDS-PAGE of 8 out of the 48 purifications of the CGI-114-protein, M = molecular weight standard, W = cellular protein, P = purified protein. 1 ml aliquots of a 100 ml culture expressing the CGI-114-protein were distributed in 48 wells of a deep well plate. Cells were pelleted and recombinant proteins purified with Ni-NTA agarose. (B) Distribution of protein purification yields. Figure 2 shows the distribution of protein yields obtained for the 48 purifications of CGI-114. The standard error was 15 % and the mean concentration obtained was 1.15 μg/μl, resulting in an average yield of purified protein of 70 μg per 1 ml culture. 25 μg Ni-NTA beads were used in this procedure, so on average 2.8 μg protein could be bound to 1 μl beads. A reliable method is needed to compare the expression of one protein under different expression conditions (e.g. expression temperature) or different expression constructs of a protein domain. Our method's reproducibility was found to be adequate for such investigations. The reason for the variation of the measured protein purification yields may mainly be attributed to varying amounts of eluate volume recovery after elution with 60 μl elution buffer. A set of 15 different human proteins expressed with a combined N-terminal His- and GST-tag (pQTG) were used to compare protein purification via His-tag or GST-tag. These proteins represent a set of solubly expressed proteins of the target list of the Protein Structure Factory with varying expression yields. Proteins were expressed in 1 ml cultures in a deep well microplate. Automated protein purification was performed with Ni-NTA agarose or glutathione agarose (Figure 3). In some cases, a solubly expressed protein was identified after purification, that could not be detected upon SDS-PAGE of whole cellular protein extracts (expression clone 8b or 10a). This indicates that the purification procedure detects weakly expressed target proteins. 10% of the eluted protein sample was applied on the gel. Since the detection limit of Coomassie brilliant blue staining is in the range of 30–100 ng per band , expression of 0.3–1 μg protein per 1 ml culture can be detected by our method. Comparison of His-tag and GST-tag purification. A set of proteins were expressed with N-terminal His-GST-tag in 1 ml cultures in 96-deep well microplates. Recombinant proteins were purified using either Ni-NTA-agarose or glutathione agarose. The Coomassie-stained SDS-PAGE shows the expression products of 15 different proteins purified on the pipetting robot. Numbers in the upper panel indicate the expression clones. The lanes of the lower panel correspond to the upper panel. The first lane per clone represents the whole cellular extract and the second lane the purified protein. Expression clones of two different transformants resulting from the same expression construct are represented by annotations a and b, respectively. M = molecular weight standard, kDa. 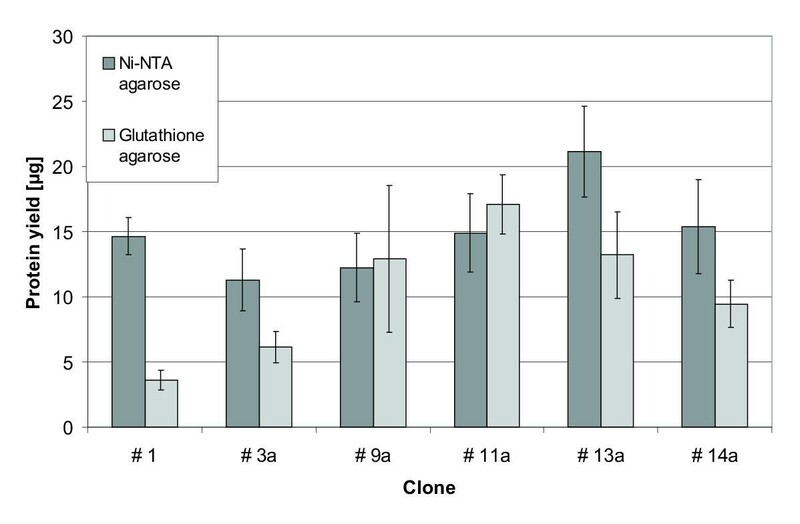 Figure 3 demonstrates that purification of the same proteins via Ni-NTA agarose or glutathione agarose lead to similar results. However, the yield of purified protein was in some cases lower with GST-tag purification. To quantify this difference, we expressed six different proteins of the set in shake flasks. Upon expression, each culture was distributed to eight wells of two deep well microplates, resulting in two identical plates. 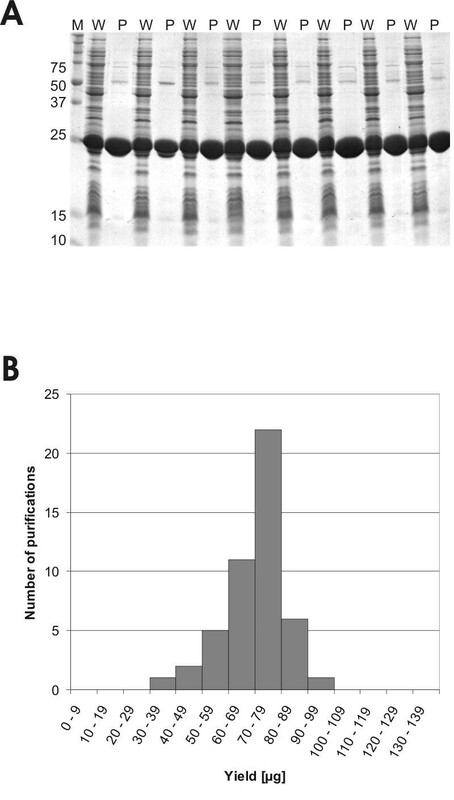 After pelleting the cells, recombinant proteins of one of those plates were purified with Ni-NTA agarose, and proteins of the other one with glutathione agarose and protein yields were quantified by Bradford assay (Figure 4 and conc.txt (see additional file 1)). Two expression clones showed comparable protein yields when being purified with either of the two affinity beads (clones 9a and 11a), whereas four of the six tested expression clones (1, 3a, 13a and 14a) showed significantly lower protein yield when purified with glutathione agarose. 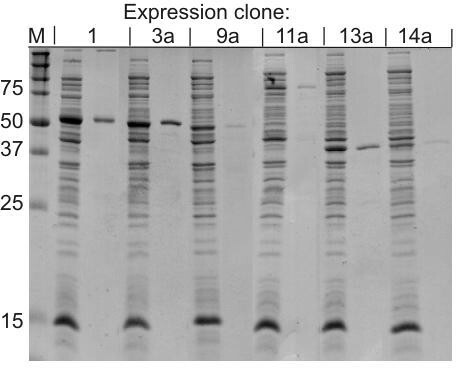 With three of these four expression clones (1, 3a and 13a), we could detect a significant amount of protein remaining on the beads after glutathione elution – by performing a second, denaturing elution with SDS-PAGE sample buffer additional protein was eluted (Figure 5). With expression clones 9a and 11a, this was not observed. Comparison of the yields of His-tag and GST-tag purification. 1 ml aliquots of a 100 ml culture of expression clone 1, 3a, 9a, 11a, 13a and 14a were distributed in two deep well plates, 8 wells/plate. Cells were pelleted and the target proteins of one plate were purified with Ni-NTA-agarose and those of the other plate with glutathione agarose. The obtained protein yields are shown here. Denaturing elution from glutathione agarose. Glutathione agarose beads from the purifications of the expression clones clone 1, 3a, 9a, 11a, 13a and 14a (see Figure 4) were washed with wash buffer after glutathione elution. A second elution was performed under denaturing conditions with SDS-PAGE sample buffer to elute proteins that could not be eluted with glutathione. The first lane per clone represents the whole cellular extract and the second lane the purified protein. We suggest that the lower yield of some of the proteins from glutathione affinity chromatography compared to Ni-NTA affinity chromatography can be attributed to incomplete elution from the glutathione support. Difficulties with the elution of GST-tagged proteins bound to a glutathione support have been reported previously . The lower yield obtained for expression clone 14a may result from incomplete binding of the expressed protein to glutathione resin. We present here a fully automated, efficient and reproducible method to purify proteins in 96-well format expressed as fusions with His- or GST-tag in E. coli. The method is applicable to high throughput expression screening. The good reproducibility is essential if different conditions are tested for one target protein, e.g. different expression temperatures for optimising soluble expression. When comparing the purification of expression clones having a His- and GST-tag with Ni-NTA or with glutathione agarose, it can be observed that the purity of the prepared proteins is similar. However, the protein yield is in some cases substantially higher when the protein is purified with Ni-NTA agarose than with glutathione agarose. We propose that this difference is often due to incomplete elution of GST-tagged proteins from glutathione agarose with glutathione. With our method up to 90 μg, usually more than 10 μg, of His-tagged protein can be purified from a 1 ml culture, depending on the expression clone. Such amounts are sufficient for various functional studies, e.g. interaction assays. All proteins were expressed in E. coli SCS1 cells. The test clone used to evaluate the reproducibility of the method was expressed with a N-terminal His-tag and C-terminal StrepII-tag in the pQStrep2 vector (GenBank accession AY028642). The set of different proteins were expressed in a vector (pQTG) which leads to a N-terminal His-GST-fusion to the protein. The vector pQTG has been derived from pQE30N, a modified pQE-30 vector (Qiagen), that has an additional NotI-restriction site in the multiple cloning site (obtained from Eberhard Scherzinger). A DNA fragment coding for the GST-tag and a TEV-protease site was amplified by PCR from the vector pETM30 (obtained from Gunter Stier, EMBL) and was cloned into the BamHI-restriction site of pQE30N. Fusion proteins expressed in the pQTG-vector can be purified with a metal chelate affinity matrix or glutathione agarose. All chemicals are purchased from Merck except for Ni-NTA-agarose (Qiagen), glutathione-agarose (Sigma) and Coomassie Brilliant Blue G 250 (Serva). CGI-114 protein concentrations were measured by absorbance at 280 nm (MW = 26,275.0, ε = 32,896 (M cm)-1); for all other proteins, protein concentrations were determined with the Bio-Rad Bradford Assay Reagent with BSA as the standard. 2xYT-Medium: 16 g/l tryptone, 10 g/l yeast extract, 5 g/l NaCl, pH 7.0; SB-medium: 12 g/l Bacto-tryptone, 24 g/l yeast extract, 0.4% (v/v) glycerol, 17 mM KH2PO4, 72 mM K2HPO4, phosphate buffer was autoclaved separately. Lysis buffer for His-tag purification: 20 mM Tris-HCl, pH 8.0, 300 mM NaCl, 0.1 mM EDTA, 10 mM imidazole, 1 mM PMSF; lysis buffer for GST-tag purification: 20 mM Tris-HCl, pH 7.4, 300 mM NaCl, 1 mM EDTA, 1 mM PMSF; lysozyme buffer for His-tagged proteins: 20 mM Tris-HCl, pH 8.0, 300 mM NaCl, 0.2 mg/ml lysozyme, 0.5 % Brij 58, 10 mM imidazole, for GST-tagged proteins the same buffer without imidazole; benzonase buffer: 50 mM Tris-HCl, pH 8.0, 1.2 mM MgCl2; 4xSDS-PAGE sample buffer: 0.2 M Tris-HCl pH 6.8, 8% SDS, 0.004% bromphenol blue, 40% glycerol; wash buffer: for His-tag purification: 20 mM Tris, pH 8, 300 mM NaCl, 10 mM imidazole; for GST-tag purification the same buffer without imidazole; elution buffer for His-tagged proteins: 20 mM Tris, pH 8, 300 mM NaCl, 500 mM imidazole; elution buffer for GST-tagged proteins: 20 mM Tris, pH 8, 300 mM NaCl, 10 mM reduced glutathione. A 96 deep-well microplate with 2 ml cavities was filled with 0.1 ml 2xYT-Medium supplemented with 2% glucose, 100 μg/ml ampicillin and 15 μg/ml kanamycin. Pre-cultures were inoculated with 96 expression clones using a custom made steel replicator carrying 96 × 6 cm long pins. The plate was sealed tightly and bacteria were grown overnight at 37°C. 0.9 ml pre-warmed SB-medium was added. The plate was covered with a lid allowing air exchange and a 3 h incubation at 37°C was carried out. Protein expression was induced for 3 h at 37°C by adding IPTG to 1 mM IPTG final concentration. Cells were harvested by centrifugation at 4°C at 2000 g for 10 min and frozen at -80°C. 100 ml of SB medium were inoculated with overnight cultures in 2xYT medium supplemented with 2% glucose, 100 μg/ml ampicillin and 15 μg/ml kanamycin and were grown to a OD600 of 1.5. Protein expression was induced by addition of IPTG to 1 mM final concentration for 3 h.
The Speedy pipetting robot (Zinsser Analytic AG, http://www.zinsser-analytic.com) has four steel pipetting needles and is equipped with a cooling plate that is temperature controlled by an external cooling device. Furthermore, the robot has a vacuum block that accepts standard 96-well filter plate. Filtration can be achieved by either applying vacuum to the vacuum block or by applying pressure. The pressure is delivered through the four pipetting needles that can be filled with air and that can pick up plastic plugs ("shutter") to close the filter plate's wells (see Figure 1). Additionally, the machine is equipped with a high-speed microplate shaker and a plate handling device. His-tagged and GST-tagged proteins were purified on the pipetting robot according to the following protocol. Shaking is performed at 1,500 rpm. Reactions are carried out at room temperature except otherwise noted. A microplate containing bacterial pellets stored at -80°C is thawed and cell pellets are resuspended by adding 150 μl of lysis buffer and 5 min shaking. 35 μl lysozyme buffer are added to the resuspended cells, followed by 30 sec shaking. The cultures are incubated for 30 min on the robot's cooling plate to reduce the temperature in the wells to approx. 13°C. 35 μl benzonase buffer containing 0.1 Unit/μl benzonase gradeII (Merck, Darmstadt, Germany) is added and plates are shaken for 30 sec followed by a 30 min incubation on the cooling plate and another 30 sec shaking step. 20 μl aliquots (whole cellular protein sample) are transferred to a PCR microplate containing 7 μl of 4xSDS-PAGE sample buffer. 50 μl of a 50 % suspension of either Ni-NTA agarose or glutathione agarose beads equilibrated in wash buffer are added. Immediately before this step, the 50 % percent slurry is mixed with the pipetting needles. The plate is shaken for 30 min to bind the protein to the affinity beads. At this stage the volume in each well is 300 μl considering that the cell pellet comprised 50 μl. 150 μl wash buffer is added to increase the volume to over 400 μl. This volume increase improves the performance of the robot's liquid detection system, which is required in the next step when the affinity beads/cell extract – suspension is transferred into the filter plate. To reliably transfer the beads settled on the bottom of the well, the robot's pipetting needles detect the liquid surface and carefully resuspend the beads twice by slowly aspirating 100 μl and dispensing with higher velocity. Then the bead suspension is transferred to a 96-well filter plate residing on the robots vacuum manifold. The filter plate is equipped with large-pore polyethylene frits (Macherey & Nagel, Düren, Germany, 96-well filter plate). To ensure that no beads have been residing in the deep well plate, 400 μl wash buffer is pipetted into the plate and a transfer to the filter plate is carried out as described above. The beads in the filter plate are washed by adding 400 μl wash buffer and subsequently pressing out all liquid by applying positive pressure through the pipetting needles. The robot then places a collection microplate inside the vacuum block to receive protein eluates. 60 μl elution buffer is added into the wells of the filter plate. Eluted protein is transferred into a collection plate by applying pressure. The obtained samples are subjected to protein concentration determination or to SDS-PAGE with 15% polyacrylamide separation gels according to Laemmli . Gels were stained with Coomassie Brilliant Blue G 250. For the GST-tag purification a second denaturing elution from the beads with 60 μl SDS-PAGE sample buffer was performed after the beads had been washed with 500 μl wash buffer. We are thankful to Martina Drechsler and Janett Tischer for technical assistance as well as Catarina Holz and Grant Langdon for critical revision of the manuscript. This work is funded by the Bundesministerium fuer Bildung und Forschung, Germany. C.S. and K.B. developed the automated purification protocol and evaluated the data. C.S. performed the protein purification. The expression clones were prepared by V.S.